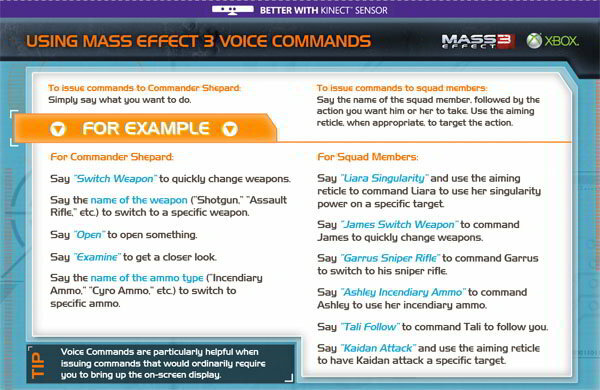 You probably already know that Mass Effect 3 features voice commands when Kinect is used within the game. Here's a sweet guide that will help you remember what to shout out when you're in the thick of the action! I think the best use of the voice commands will be calling tactics for your squad members to employ. As the guide suggests, voice commands should be employed where you don't want to issue a commnad via the controller that would ordinarily require you to bring the on-screen display up, thus allowing for a quicker and less stop start run through.